Carmen Tellez of Charm and Happy was invited by Principal Mr. Vasquez at Rancho Santa Gertrudes Elementary School to be honored as "Principal for a Day". This was a community effort organized by the Whittier Chamber of Commerce to pull local schools and business entities together. Carmen and other honorary principals at other schools in Whittier experienced first hand the role of a principal. Sheesh, I thought all they did was wait for bad kids to go the office to be told to behave or do homework next time. No, no, no. By far not the case. From the moment I walked in the office, the phone was ringing. Signatures were needed for this and for that. Research was required for this Educating seminar for teachers and that field trip for the kids. Did you know that when a principal puts a request into the district office, they have to use a particular format. The request could be anything having to do with asking for money for the school. He and a few teachers at his school brain stormed a strategy to request upgrading computers, software and the proper training. They even included information on how to encourage the teachers to participate in training process. It is very important that they think of everything possible to eliminate as many questions that can possible be asked the district office reviews the request. I participated in a decision to rectify a situation among a few boys. It was a tough choice but Mr. Vasquez and I agreed that it really was just a misunderstanding and the boys agreed too. It was funny when those boys used a term "softy" in reference to a game. Mr. Vasquez had no idea what they were talking about. I filled him in with the meaning later. He laughed and said amazing how I new their "kid lingo". We visited several classrooms of varied grades. In each class, I got to meet the teacher and greet the kids. Each class had a chance to guess what profession I was in. I gave a few hints like, I wear big shoes on the weekends. I wear funny looking clothes. They guessed I was a clown. Yup, right answer. Oooh! their little faces glowed with excitement. Then they wanted to ask lotsa questions. It was fun answering them. Do I get pies in the face? Have I ever been shot out of a canon. Are my feet really big? Are clowns smart? Do I like being a clown? Can I go to their birthday party? When we went to the cafeteria, there was a group of kids rehearsing for a play about the hen that plants the seeds to make something sweet. All the hens friends wanted a piece but none wanted to help make it. It was a play intended to send a positive message. When we visited the Special Ed teacher, I was happy to give her a few leads to low prices teacher outlet stores. 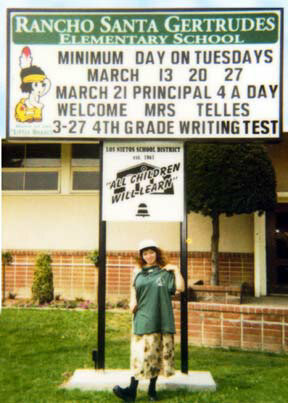 Her room was still decorated with "Cat in the Hat" theme from the last event to promote kids to read. I really learned alot. Probably far more than Mr. Vasquez would ever imagine. I was like a sponge the whole. Soaking up all I can. My original intent for volunteering to be principal for a day was just to have an excuse to give my business card. Instead I made a few friends. So you may be wondering what I learned. Principals should be very smart and their toes. Maybe take a few "kid lingo" classes for the fun of it. hee, hee. Mr. Vasquez has excellent organization skills. He does not just think of what his job consists of for the day, but also how to constantly improve the kids education and how to encourage teachers to work as a team with each other for the kids, all the kids. Schools are made up of many different backgrounds, lifestyles, and because of this, Mr. Vasquez has to be aware of possible interruptions that may also arise in a school day. For example parent custody problems among uncooperating parents or step parents. Also dealing with keeping a drug free school. How to be organized and not panic during an emergency or a fire drill. We ended the day with him presenting to me a staff shirt and cap. I gave him an 8x10 photo of Charm the Clown. And we shook hands.